Taste test: These are kettle-style potato chips, similar in texture and shape to Cape Cod chips. 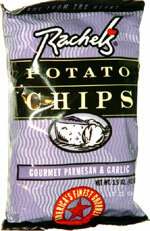 They're pretty good, with a very tasty and mild parmesan and garlic taste and a nice crunch. It's good that they didn't go overboard with too much flavoring, but the flavoring's sufficiently mild that adding just a little bit more would be an improvement. My main issue with these chips was the cost. This 1.5 oz. bag cost a whopping $1.50. At that price, they really should be the best chips in the whole world. 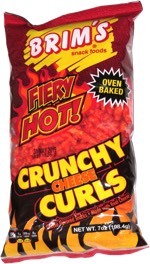 Yeah, they're good, but no way are they the best chips on earth. Smell test: Very, very slight garlic smell.